CAS-ual Fridays: The New & Improved CAS-ual Fridays Challenge! The New & Improved CAS-ual Fridays Challenge! but there is always room for improvement! 1. We are a Clean And Simple Challenge. 2. There are NO product requirements to play or win. you are NOT required to use CFS products in order to play or win. with at least 3 weeks of playing time per challenge. 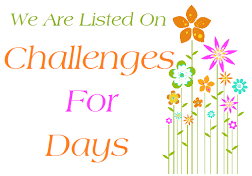 So our next challenge which begins on February 28 will last until March 21st. You can play as often as you'd like, and link to as many challenges as you'd like. but will also earn a guest spot on the CAS-ual Fridays Stamps store blog! Our 4 Favorites will be getting a prize too! They will win the CFS stamp or Fri-Dies of their choice! MORE recognition means our Happy Hour will be even happier than before! MORE time for happy dancing. AND, our contenders will now have their projects featured in the Happy Hour post too! There will be 12 prizes up for grabs over the next 3 days!! and find out how you might win one of 4 prizes being offered each day! and I can't wait to introduce them!! when I'll introduce the first 3 Girl Fridays!! Aw what the heck...let's make it 13! Yes, I'm excited and I know it! Looking forward to the changes! Love your challenges and the changes sounds interesting!! Love the new format, waiting to meet the new team. I love the challenges here by far the funnest? is that a word? lol. Cant wait to see the new girl fridays. Fabulous new format, I got up early this am to find out what you were planning. Oh boy, would I love to win! I always loved coming to the cas-ual fridays challenge blog for my dose of CAS goodness and with all the new ness, love it even more :) Sounds really exciting! Wow - these are great news! I'm looking forward to the new Design Team and to the next challenges! WOO HOO! I'm sooo happy, might just have to go and mix myself one of those Happy Hour cocktails!!! Sounds great! Can't wait to play! Can't wait to see all of this put in action! Very exciting changes! It's a Fantastic idea to reward the Top picks as well as a random winner! Can't wait to play along! I am definitely excited, sounds super fab!! Love your changes! More time, more prizes - what's not to love! I'm hoping to play along over here a lot more. Yep, it does indeed sound super exciting! Bring it on!! Sounds great! Can't wait to see what you come up with for the new challenges and who's in the design team! Great blog post--you've got me interested in returning to see what other surprises you have in store. It all looks good and congrats on your new plan for fun! So exciting ! I love to play along and having more time will be great ! Looking forward to seeing the new a Girl Fridays ! Lotta of changes! Looking forward to the new challenges and new team. Although I'm generally not fond of changes, the changes to this blog sound great! Yes! So excited to have more time!! Love your challenges, now maybe I can join in more often!! I've never played along with CAS-ual Fridays before, but it sounds like fun and I love the clean and simple style. Glad I found you! Awesome news!! I love that you extended the time to play!! Now I can get back to playing along!! Looking forward to joining in your challenges, love the monthly format, more time to play along. I love the new format. with three weeks to play it will give me time to create without rushing. I always seemed to miss the deadline before. can't wait to meet the new crew. Sounds like a week long party! So exciting! Yay, more time to play, plus a party! I think this is great!!! Can't wait! Can't wait to see the Girl Fridays! I am happy there is more time! I always want to play ,but sometimes run out of time. Can not wait! Sounds fun!!! Very excited - the more playing time will help me out. I always like the challenge but don't give myself time to complete it. Awesome news while watching the final men's hockey game of the Olympics! Go Canada! Great news! ! I love that you extended the time to play!! Now I can get back to playing along!! Looking forward to it! Hooray! Great news! So excited with the new changes! Looking forward to it! Your excitement and enthusiasm is contagious! I can't wait to see all the great changes in store. Whoop whoop! It all sounds awesome! It's amazing to see how far CASual Fridays has come! Sounds all very exciting! Can't wait for tomorrow! Looking forward to the new format, and new DT! How fun! I hope I'll be able to play more often! Sounds like fun and I am always inspired but the designers. You've been incredibly busy behind the scenes and the results: a series of changes that are nothing short of stellar! Looking forward to meeting the new DT; we know their inspiration with your products will be dazzling and delightful! Love this new format, change is good:-)!!! can't wait to see all this up-dates!!! and of coure wish you luck and lot of new inspiration and readers! They say the only thing constant is change. Well, and laundry. Laundry is always constant! LOL! Sounds like your changes are for the good! Excited to see who the new design team members are! Yay! I really like the new changes! It will give me time to play! This is awesome! Great news and great changes, for good definitely. I will have more time to play along and have the chance to do more than one entry. So fun. Congrats on these new changes and the team. Wow - those ARE exciting changes! Can't wait to play along with you!! How exciting! I can't wait to play along! It's nice to know that I might have a better chance to win a prize or be recognized! I think it sounds great! I love that you are extending the play time as I often miss the challenges that I love the most. Excited to meet the new DT. Congrats! This is not what I expected. But I am even more thrilled now!!! awesome...more time to play along would be great. Wow! Super excited...love the extra playing time. The new improbement sounds greta, love the extra time we get. New things in the pipe line! Girl, when you do something you do it up BIG! So many exciting and super fun announcements this morning!!! Can't wait to meet the new Girl Fridays! YAY! my new year's resolution (in the card dept. )was to enter challenges - all the new additions look so fun and more time to play is great - so looking forward to joining some of yours. Sounds wonderful, I love the challenges and would love to play a lot more! I always gain so much inspiration from the other players! Thanks for the opportunity to win! So glad, you are allowing more time for the creative juices to flow...and find time to actually create something. Looking forward to finally participating. I love the new changes! The recognition will be so great for networking! Can't wait to start! How could you not be excited about this???? Wonderful changes !!! I can't wait to play along and to see what new desingers will inspire us for the upcoming months! I think this is an awesome idea! I always come here for inspiration but don't participate. I might have to start! It's already a great challenge but looking forward to all the changes too now. Very exciting! Love the CAS challenges and am looking forward to the changes being made. This sounds so exciting. Really looking forward to meeting the new team! Love the change Michelle! I see a challenge and then time flies and I miss a chance to join in! Looking forward to meeting the new designers! Wonderful improvements! Can't wait to see the new team! Sounds exciting... I've never participated in any challenges, but I'm excited to give it a try. Looking forward to seeing the team. That IS a big announcement! Monthly format sounds fun, lots of time to play! This is great! Love the new changes. Very excited for the monthly format to have more time to play!! looking forward to the new format challenges; thanx for the inspiration and blog candy opps! Yay!!! I am def. excited! Thanks so much for the fun!!! Yes I'm excited. I can't wait to see the new design team and what you have in store for us next week. Bring it on!!! This is so exciting. I have been really working on my CAS style, so I am really eager to have a bit more time to play along. I look forward to the changes and the new DT. Yes! Let the fun begin! WOW so much exciting news! As always, I look forward to playing in your challenges! Thanks for a chance to win! I've been following your challenge for a while but haven't had a chance to participate, so I'm excited about the longer playing time! A week goes by so fast, but I think with three I can probably make it. =) Looking forward to the fun! Sounds like a great plan with more time to craft. Oh ya, I want to win! Sounds great! I'd love to start playing in your challenges as more CFS would be welcome in my collection! Sounds great! Can't wait to join in and going monthly means I won't be too late! Sound like you have some very exciting things in store for us. Who doesn't like to win free products. Love the new format! Maybe I'll be able to join in the fun. Thanks for the chance to win! Too exciting!!!! I am on pins and needles for the unveiling of the new DT and the changes too!! Change is exciting! Looking forward to it all! I love this new format! My favorite thing is having more time to play with each challenge. While I didn't have time to play every week, I think I could almost always play along with all the extra time. Can't wait to see who all is on the new team. Sounds fun! Can't to begin! What a BIG bunch of fun changes. This is exciting! These challenges are what keep me crafting during the hectic work week! Can't wait for Feb 28th! Wow how exciting!! I think we all need some changes once in a while to keep thing interesting! And I especially like the fact that we have more time to play!! Yay! No wonder you couldn't wait for Sunday morning to come around, what a fantastic announcement!! I've only just started playing along with your challenge and loving it. All these new improvements are fantastic and will make the challenge even more exciting!! I can't wait to see what the girls come up with tomorrow and what the challenge will be on the 28th!! How exciting, I always love something new. It revs up the mojo. The changes sound awesome, Michele! Can't wait for all the excitement this week! Can't wait to meet the new designers and have more time to create. Change is tough, but I for one will appreciate having more time to submit projects. Life seems to get busier every year. :) Can't wait for the first new challenge. So excited for the new changes! Wow! I'm excited by all the new changes and look forward to seeing the new designers' creations!! How fun. I'm looking forward to the new format. wow! big changes ahead, and it all sounds very exciting! How awesome! I like the extra time, since I sometimes forget deadlines. Extra prizes are good too. Yay! More time to play! Love the changes! The door stays open longer - yay! Can't wait to meet the new girls. So many news and so much fun! I love the idea of more time to play with challenges... Thank you! OMGOSH!!!! All these comments ...but the changes are FABULOUS:):) I've really only been playing a little on the margins but for certain to have more time... FAB idea!!!!! A Baker's Dozen! I'm up with that. Thanks. WooHoo! Loving the longer timeline! Great changes, Michele! Awesome changes. Love having more time to play along. Change can be can be tough but also good! Sounds great, and looking forward to seeing the new DT! Michele, so excited to meet the new team, the extended playing time and more prizes!!! This is awesome! More time love it! I am always inspired by the dt! Love cas and your team can really rock it. I learn so much. Thanks for tha chance to win! Change is good & let's hear it for "Lucky 13"!! You're really outdone yourself!! It's going to be great!!! Sounds like a great bunch of updates, hooray! Can't wait to join on in!!!! Thanks for always inspiring me! Great changes! Looking forward to the next challenge. Sounds like FUN! I especially like that I will have a lot more time to link-up. That in itself may result in more crafters linking up their projects, which will ensure more inspiration, all-around. :) Looking forward to "meeting" the new DT! Woah!! This mew format is awesome! I love the extra time to play :) and MORE prizes!! Can't wait to meet the new team. Wow- can't wait to play along! Always stop by this blog for great inspiration and ideas! Can't wait to see all the new DT members and maybe play along in a few challenges. Change can definitely be a good thing! This is one of my favorite challenges. Even when I don't have time to participate, I love to come to look for CAS inspiration! Sounds like some exciting changes are in store! Looking forward to the DT reveal and the first challenge! This is one of my favorite blogs for CAS inspiration. Looking forward to the new Design Team. The changes sound great! Can't wait!! Like the new format...can't wait to see what the new DT comes up with! Sounds like fun. Love all the new ideas. Look forward to playing along. I love your new format. I am a full tome mom and 4th grade teacher. I. Don't get a lot of time to create. Having more time will be great! Thanks. Wow ! The New format looks very interesting ..I am eager to meet the new team ! Love it and can't wait to see more, lots more! I'm excited - I like having more time to be able to participate in the challenges! Looking forward to your new ideas. Sounds like a lot of fun is coming our way!! The monthly challenge sounds great, I sometimes struggle to enter when the challenges only last a week. ...can't wait to see what the new DT comes up with! I'm excited and I know it! (and I did clap my hands too) Love the changes and can't wait too start. Finally more time for participating and even a better chances to be in the spotlight. whoohoo. CAN'T WAIT TO JOIN IN WITH ALL THE FUN AGAIN. Excited to have more time! Pleased to hear about the changes. Thats exciting. More time and prizes. Can't wait! I've learned so much about CAS design from all of you. Thank you for all the inspiration!!! This should be fun and can't wait to see all the changes come about. I am so excited to meet your new design team.